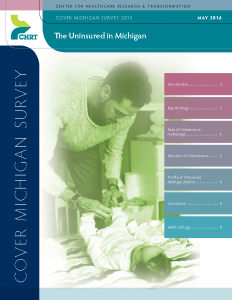 This brief examines the characteristics of those in Michigan who reported being uninsured approximately two years after the ACA’s major coverage provisions went into effect beginning in 2014. The brief is based on data from the Center for Healthcare Research & Transformation’s 2015 Cover Michigan Survey of Michigan adults, fielded between October and December 2015. Comparison data is drawn from the 2009, 2011, 2012, and 2014 Cover Michigan Surveys. Five percent of respondents reported being uninsured at the time of the survey. By comparison, in 2012, 14 percent of respondents reported being uninsured. More than twice as many respondents reported having been uninsured at some point during the year before the survey than were uninsured at the time of the survey, indicating that many of the uninsured gained or regained coverage relatively quickly. 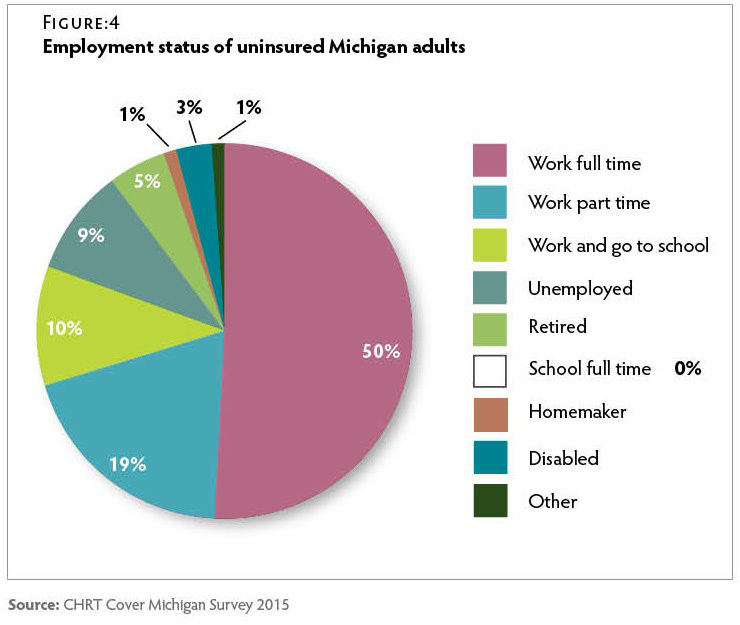 Half of uninsured respondents worked full time. Sixty-four percent of the uninsured were male. Thirty-nine percent of uninsured respondents were between the ages of 18 and 30. Half of uninsured respondents lived in small cities or towns. 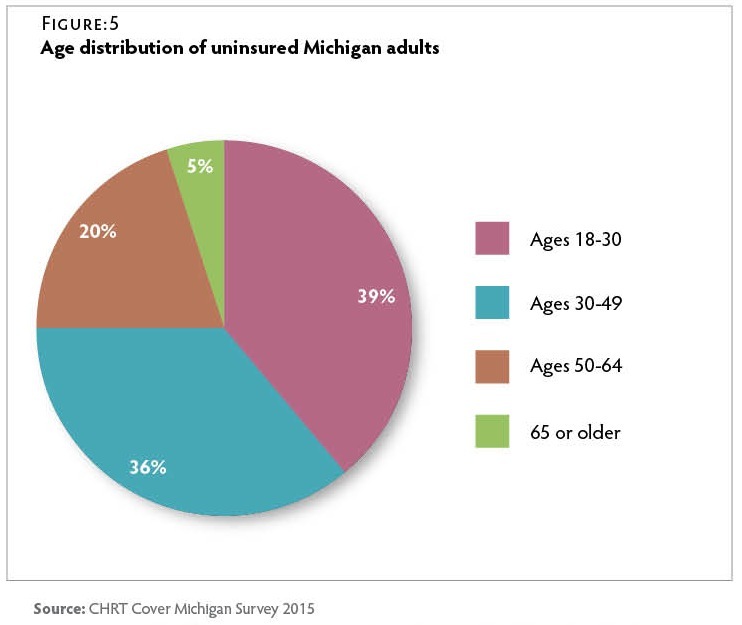 Overall, those who remain uninsured are not a static group, and most Michiganders who reported having been uninsured during the year prior to the survey were uninsured for only short periods. 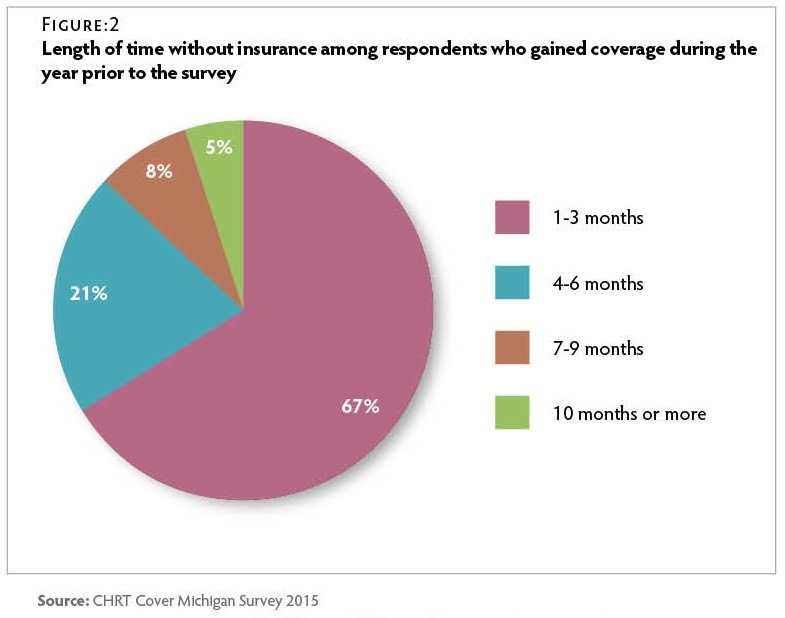 Although the number of Michiganders without insurance has declined significantly, achieving continuous coverage may still pose a challenge. Respondents were significantly more likely to report having been uninsured at some point during the year prior to the survey than they were to report being uninsured at the time of the survey. Thirteen percent of respondents reported that they were uninsured for at least part of the year leading up to the survey, compared to only 5 percent at the time of the survey. Eighty percent of the uninsured were white and 20 percent were African American. No uninsured respondents reported being of Hispanic origin. Fifteen percent of those who reported being uninsured lived in rural areas, 50 percent lived in small cities or towns, 14 percent lived in suburban areas, and 20 percent lived in urban areas. Characteristics of the uninsured did not differ significantly between 2014 and 2015. 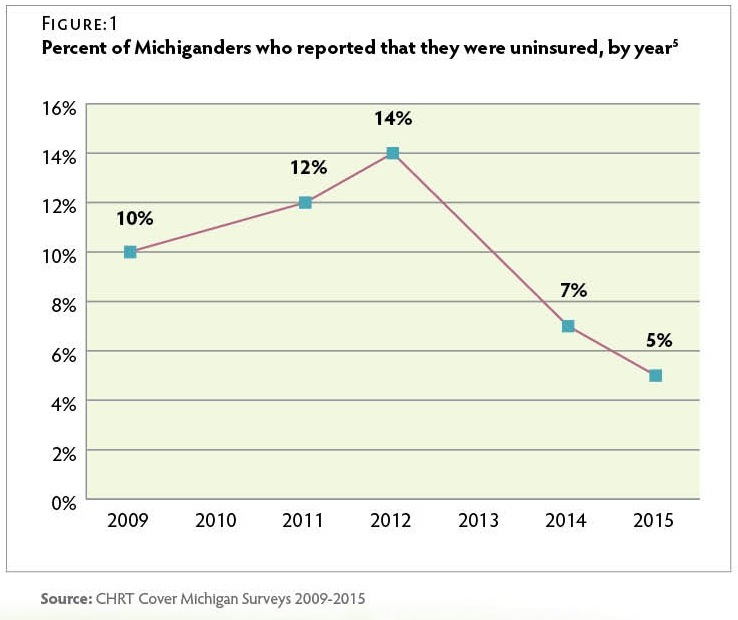 The uninsured in Michigan are not a static group; many of those who reported being uninsured at the time of this survey had insurance at some point in the previous year. High proportions of the uninsured were young, male, and/or employed full time. Many did not have a college education, and half lived in small cities or towns, suggesting that future enrollment efforts might be most effective if targeted at these groups. The majority of uninsured respondents reported annual household incomes likely to make them eligible for Marketplace premium subsidies. 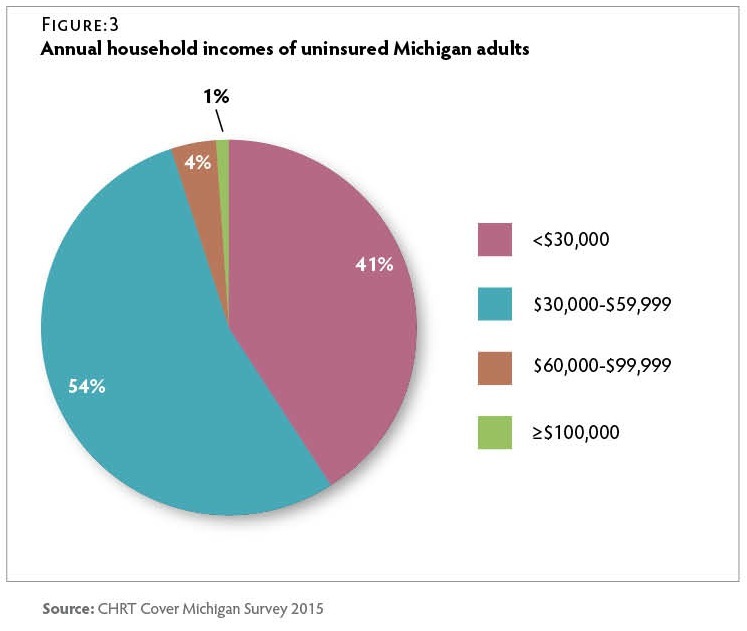 This suggests that further education initiatives focused on eligibility for these subsidies could help many uninsured Michiganders find affordable coverage. The survey data presented in this brief were produced from a series of survey questions added to the Michigan State University Institute for Public Policy and Social Research (IPPSR) quarterly State of the State Survey. The survey was fielded between October and December 2015, and included a sample of 972 Michigan adults, with a 17.0 percent response rate. The margin of error for the entire sample was ±3.9 percent. The sampling design, a random stratified sample based on regions within the state, was a telephone survey conducted via landline and cellular phones of Michigan residents. For analytical purposes, survey data were weighted to adjust for the unequal probabilities of selection for each stratum of the survey sample (for example, region of the state, listed vs. unlisted telephones). Additionally, data were weighted to adjust for non-response based on age, gender, and race according to population distributions from 2009-2013 American Community Survey data. Before weighting, 40 respondents reported being uninsured. Respondents who reported both Medicare and Medicaid coverage were considered Medicaid recipients for the purpose of this analysis. Results were analyzed using SAS 9.4 software. Statistical significance of bivariate relationships was tested using z tests or chi-square tests for independence. All comparison tables are statistically significant at the p ≤ 0.05 level unless otherwise noted. A full report of the IPPSR State of the State Survey methodology can be found at: http://ippsr.msu.edu/soss/. The Affordable Care Act is Working (Washington, D.C.: U.S. Department of Health and Human Services, June 2015) http://www.hhs.gov/healthcare/facts-and-features/fact-sheets/aca-is-working/index.html (accessed 4/11/16). R. Cohen and M. Martinez, Health Insurance Coverage: Early Release of Estimates From the National Health Interview Survey, January–March 2015 (Atlanta, G.A. : Centers for Disease Control and Prevention, Aug. 2015) http://www.cdc.gov/nchs/data/nhis/earlyrelease/insur201508.pdf (accessed 4/21/16). The 2015 Federal Poverty Level for households of 3 people, the average household size of survey respondents, was $20,090. Those making up to 138% of the Federal Poverty Level, or $27,724 for a household of 3, are eligible for Medicaid. Those making up to $80,360 are eligible for Marketplace subsidies (https://aspe.hhs.gov/2015-poverty-guidelines). 40 respondents reported being uninsured at the time of the survey. The margin of error for the entire sample was ±3.9 percent and the margin of error for subgroup analyses of the uninsured was ±15 percent. The Cover Michigan Survey was not fielded in 2010 or 2013.